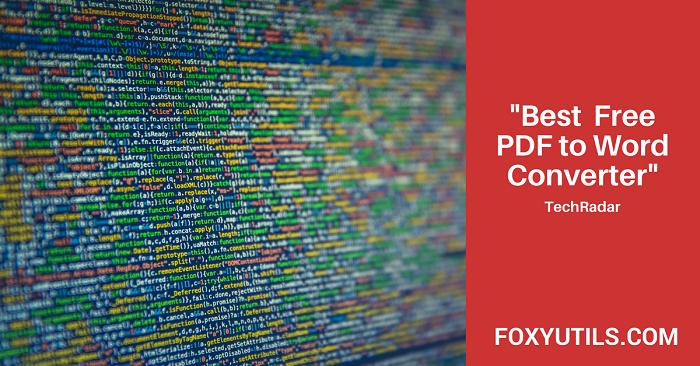 After comparing a number of different PDF converters, the team at TechRadar named FoxyUtils the #1 tool to convert PDFs to Word documents! « FoxyUtils was by far the cleverest [converter] when it came to picking a font similar to that of our test document, outputting a Word file very close to the original PDF. Second, it did well with the images in our document, recognizing that there was more than one and breaking them up appropriately. And third, when you use FoxyUtils’ tools, you contribute to the company’s tree-planting efforts. » Read the rest of the story here. You can use our PDF to Word Converter for free, with some limitations on single file size upload. Or try FoxyPremium to access all features. If you are new to FoxyUtils, you automatically get a three-day free trial of our pro plan by signing up with your email. And don’t forget to follow us on Facebook and Twitter for all the latest news and updates.